We are a coveted organization that is involved in manufacturing, supplying, wholesaling, distributing, trading, retailing and exporting Rail In Motion Weighbridge. All these products are manufactured as per the requirements of RAILWAYS/ RDSO. All these products are very simple yet powerful, and allow the user to install the system in short span even at a very narrow curved line. These products are designed with new and simple algorithm to deduct complex engine and wagon’s track pattern. We are a prominent organization that is involved in supplying, wholesaling, distributing, trading, retailing and exporting In-Motion Rail Weighbridge. 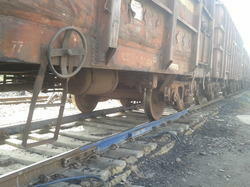 The offered system is manufactured employing new and simple algorithm to deduct complex engine and wagon's track pattern. Furthermore, we customize these systems as per the various requirements of clients. We are identified as one of a paramount manufacturer, supplier, wholesaler, distributor, trader, retailer and exporter of Rail Weighbridges. To manufacture the offered range, we have hired highly experienced and trained professionals. These professionals do not compromise with quality and make sure to use high grade material in the manufacturing process. 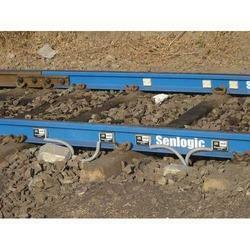 Looking for Rail Weighing ?